After Friday's test day all the drivers were confident with their car's setup going into Saturday's qualifying session. At the end of the session the official results showed Jim Victor in second, Kirk Kindsfater third and Revere Greist fourth. Unfortunately for Kindsfater a glitch with the tracks timing sensor erased a blistering 1:07.9 second lap that would have put him second on the grid just a tick off of the pole time. The race start proved to be eventful for the trio of ArmsUp drivers. At the green flag Greist buzzed the front stretch wall in order to get around the 32 car of Kindsfater. Kindsfater's early race got worse when the Colorado driver was hit from behind in the carousel and forced off of the track. Victor would hold on to the second spot early on. Before midway in the race both Greist and Victor were overtaken by Brian Tomasi dropping them to third and fourth respectively. Kindsfater meanwhile had started his climb back through the field after his early race shunt. As the race came to a close Kindsfater had raced his way back to the fifth position. Greist crossed the line fourth improving one position from his first SCCA National start. Victor erased the memories of a difficult season opener by scoring a podium finish taking the checkered third after a solid drive. "This was a good event for us," Gregg Borland said at the end of the weekend. "All of our guys drove well. Kirk just had some rotten luck this weekend but it was obvious he was fast. I think we are making good gains and think this is the kind of momentum we need headed into the June Sprints." Jose Paredes also made his on track debut over the weekend in his Formula Atlantic car. Logging seat time at Road America during the SVRA Vintage Festival Paredes got close to his personal best lap time at the 4 mile circuit. 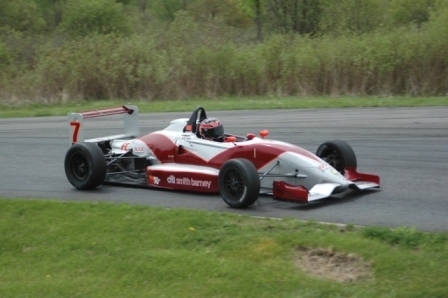 ArmsUp Motorsports next event will be May 31 through June 1 at Road America for The Milwaukee SCCA Region Double Regional. Scheduled to drive currently is John Dickmann, John and Revere Greist, and Jim Victor in Formula Continental and Jose Paredes in his Swift .014 Formula Atlantic.